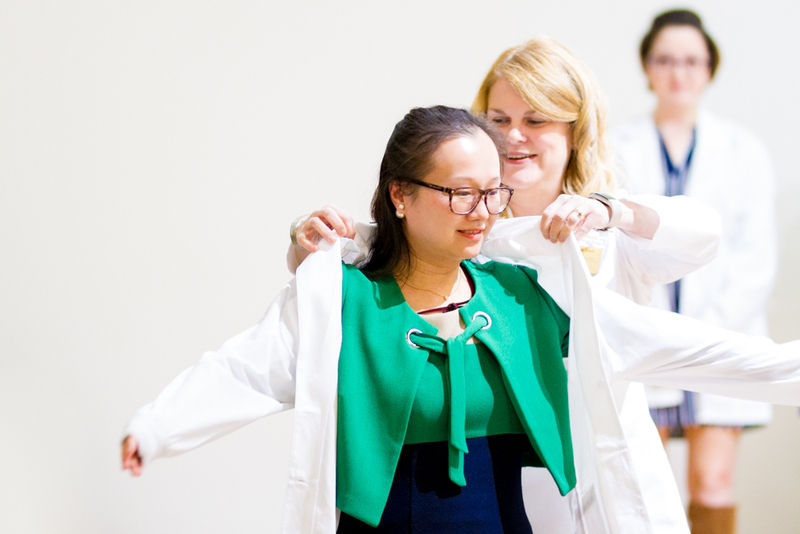 Planning for a White Coat Ceremony can be complex as you coordinate with students, parents, faculty, facilities and an entire universe of collaborators working together to make this a truly memorable occasion for all. We’ve captured here some of the key pieces that you will need to think about as you start planning. All accredited medical schools, physician assistant schools and nursing schools are eligible to receive Keeping Healthcare Human lapel pins from the Gold Foundation. The pin welcomes students to their new profession and serves as a persistent reminder of their commitment to treat patients with dignity and respect. You should request Keeping Healthcare Human pins at least 3-4 weeks before your ceremony date. With the pins, the Gold Foundation also provides a pocket card with a short inspirational message from the foundation and its founder, Dr. Arnold Gold. The card should be placed in the coat pocket and the Keeping Healthcare Human pin should be pinned to the coats prior to the ceremony. Order white coats (or your school’s equivalent) with plenty of time to allow for any customization (such as embroidering names, or attaching patches), placing pins and pocket cards, and/or rectification of any error with the order. Students should receive their white coats before the ceremony. White coats can be hung in alphabetical order or alternatively placed folded on each student’s assigned chair. Cloaking is typically done as students cross the stage. Select and invite multiple cloakers to keep the process moving smoothly. Schools use a variety of cloakers, such as orientation advisors, department chiefs, faculty mentors, distinguished alumni, etc. Typically, students are cloaked in small groups depending on the number of cloakers. As names are announced, each student takes his or her place in front of a cloaker. Once all students are in place, the cloakers place the coats on their respective students in unison. Then, the next group of students takes their place. If gifts are given, they can be handed out as the student exits the stage. Confirm and prepare participants for the process and their roles in the ceremony: who does cloaking, distributes gifts, shakes hands, etc. Some schools schedule a brief rehearsal. An inspiring and engaging keynote address is an essential component of a White Coat Ceremony. While many institutions will contract with a known speaker, in many cases an outstanding humanistic dean or faculty member could be appropriate. Speakers should explain why “Keeping Healthcare Human” is a vital and central component of good healthcare, and should describe what compassionate and respectful care looks like. Invite student families, faculty, deans and other important members of school community. Other possible guests may include the president of the state medical association and the school’s alumni association president. For your first White Coat Ceremony, a representative from the Gold Foundation may be available to attend. The oath is the central component of any White Coat Ceremony. Oaths are typically recited once all students have been cloaked and returned to their seats. Schools select an oath based on their own tradition, and it is typically the same oath recited at commencement. Often, directly following the oath, the dean presents the new class to the audience with “And now I present to you the Class of 20–!” whereupon all students turn together to face the audience. Work with your event site to arrange the ideal audio-visual setup for your event. Discuss with speakers any individual a/v needs. Have a photographer or videographer available to record the entire event or at a minimum get pictures of the students as they are cloaked. Decide how and where you will share the images, whether parents and students will be able to get a copy of the video or download photos. Arrange for class photo if desired. Share the photos on social media and tag the Gold Foundation on Instagram and Twitter, both @GoldFdtn, and use the hashtag #WhiteCoatCeremony. A processional and recessional set a celebratory tone for the event. Confirm musical arrangements for your ceremony and ensure they are adequately supported by your event site. For example, a live solo piano or string music will likely need to be amplified to be sufficiently audible. White Coat Ceremonies in which students are given clear instructions prior to the event ensure an orderly and enjoyable experience for all. Many logistics that schools use for other large ceremonies, such as commencement, are useful for White Coat Ceremonies, as well. This would include such things as having ushers in place to assist with seating and to assist students across the stage; organizing students in alphabetical line for the processional; having rows stand as a group when instructed by row organizer or usher; asking audience to hold their applause until the last student is announced and to stay seated at the end of the ceremony until the students finish the recessional. A reception following the ceremony provides a celebratory atmosphere and a moment for the community to reflect upon this important moment. Receptions can be simple (such as an ice cream social) or more formal (catered food and drinks) depending upon the school’s wishes, as well as logistical and financial resources. Arrange the layout, design, printing and quantities of printed materials. The program should include text of the oath being used, names of participating speakers, class list, history of the ceremony and credit to The Arnold P. Gold Foundation for providing the pins, as well as any other sponsorship credits. Logos for The Arnold P. Gold Foundation can be found in our Media Kit. Possible sponsors for the ceremony include your school’s affiliated hospital or alumni association, or individual alumni donors. Sponsors frequently support costs for such things as the white coats, embroidering, student gifts, reception, or general ceremony expenses. Some schools are eligible for a one-time grant from the Gold Foundation in support of their White Coat Ceremony. This grant can be used for schools establishing their first White Coat ceremony or for schools that are interested in infusing Gold Foundation principles of compassion in conjunction with scientific excellence into their existing ceremonies. White Coat Ceremony grant requests for medical and PA schools are accepted on a rolling basis throughout the year. Nursing schools apply through the American Association of Colleges of Nursing, which typically puts out a call for applications in the early summer. Drafts of sample press releases are available from the Gold Foundation for use by the school’s public relations office. Download a 2018 sample press release for a White Coat Ceremony at a nursing school. Reach out to local publications and media outlets for coverage. Coordinate with other departments to ensure that the WCC is mentioned in campus publications and calendars. The orientation letter and calendar for incoming students should mention the WCC ceremony date, time and location. Send thank you notes to special guests, faculty and student participants (ushers, cloakers, etc). Evaluation of program to take place. Send copies of invitations, programs, press articles, photos and videos (links or electronic copies) pertaining to the White Coat Ceremony to the Gold Foundation. Personal letters from students, parents and medical school personnel are most welcome. Are there other tips that would be helpful? We welcome your feedback and your tips. Please email them to info@gold-foundation.org. Best wishes on your White Coat Ceremony!